Workshop on “Preventing Tobacco Industry inferences in Tobacco Control Policy- Article 5.3 WHO FCTC” dealt with difficulties in the implementation process of Article 5.3 WHO FCTC and sought the solutions to tackle adverse inferences whose purpose is to protect tobacco industry’s interests. 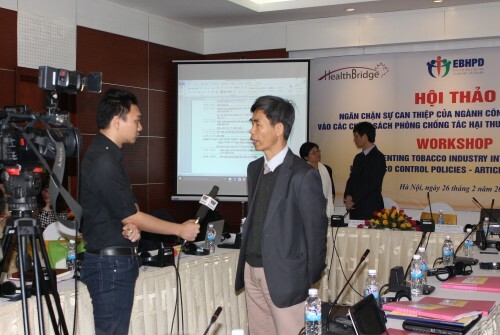 On February 26th, Evidence-Based Health Policies Development Advocacy Coalition (EBHPD), Vietnam Non-Communicabe Diseases Prevention Alliance (NCDs-VN), Research and Training Centre for Community Development (RTCCD), HealthBridge Canada in Vietnam held a workshop on “Preventing tobacco industry inferences in tobacco control policy- Article 5.3 WHO FCTC” to discuss about solutions for ceasing the tobacco development as well as preventing tobacco industry acts that influence adversely on Article 5.3 WHO FCTC. The workshop had participations of Mrs. Bungon Ritthiphakdee, Director of Southeast Asia Tobacco Control Alliance (SEATCA), WHO’s Representatives, civil society organizations and press and media. According to WHO’s statistics, smoking is the second serious cause of fatality in the world and standing behind High-blood Pressure disease. Excluding smokers, there are 600.000 fatal cases of passive smokers each year and 64% of them are women. This is an alarming figure to illustrate tobacco’s hazards posed on community’s health. Furthermore, it brings about catastrophic consequences for economics and environment due to tobacco consumption. In Vietnam, tobacco kills at least 40.000 people each year. The costs of examination and treatment process and expenses for people who lose the working capacities and suffer from illness and early deaths exceed double the tobacco tax’s revenue. Practically, taxes and prices of tobacco in Vietnam are cheap. Smoking behaviors are widely accepted by the society and law abuses of promotional commercials and public smoking are popular. There are numerous reasons for this paradox, but the most critical one is the tobacco inferences in tobacco control policies. 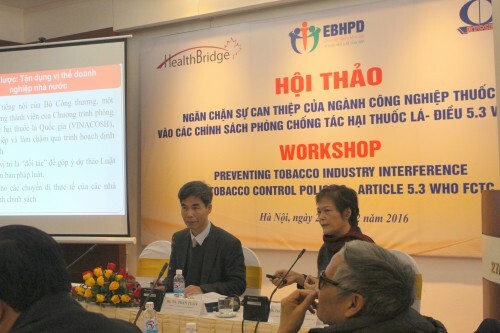 Dr. Nguyen Tuan Lam, Representative of WHO Office in Vietnam said tobacco control policies are affected significantly by tobacco industry. There is an unsolved conflict in core goals and interests between public health and tobacco industry when this industry makes profits and kills half of the number of its consumers. Mr. Lam even compared tobacco industry as a vector in global scale. While this industry puts profits as its top priority, it is difficult to erase the conflicts with public health in terms of nature and interest. Mrs. Pham Thi Hoang Anh, Representative of HealthBridge Canada in Vietnam said FCTC proposed by WHO, passed in 180 countries all over the world, Vietnam signed to participate in this Convention in the end of 2004 and this convention entered into force from February, 2005 with the aim of preventing tobacco hazards posed on people health and catastrophic consequences on economics and environment due to tobacco consumption. 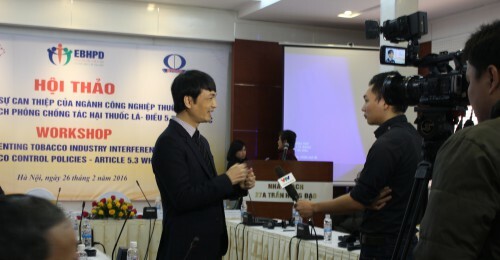 However, until now, Vietnam has not conducted WHO’s guidelines of Article 5.3 which is the reason why tobacco industry has interfered in the process of forming Law Amendments on the Special Consumption. This made the taxes which were passed are extremely low to compare with required level to be effective in reducing tobacco consumption according to national target of tobacco control. 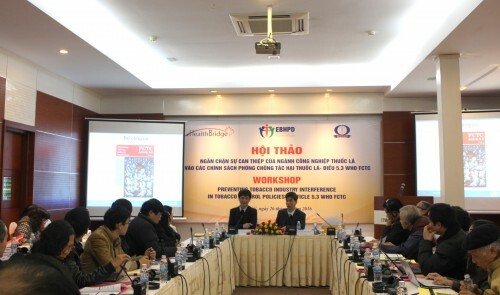 Mrs. Bungon Ritthiphakdee (SEATCA) indicated the strategies tobacco industry has used to influence public health policies. They have continued slackening off, cancelling laws, blocking tax increase and FCTC adhesion, opposing non-smoking area and commercial ban regulations; hiring politicians to work as counselors and submitting letters to Prime Minister and National Assembly to oppose new laws and lobbying government and national assembly. Mrs. Ritthiphakdee shared case studies of SEA countries in the implementation of Article 5.3. Thailand enforced a regulation called B.E.2553 to ban tobacco industry to delivery financial supports for government officials or participate in political activities and plans as well as national acts including monitoring and preventing tobacco industry inferences in tobacco control policy. 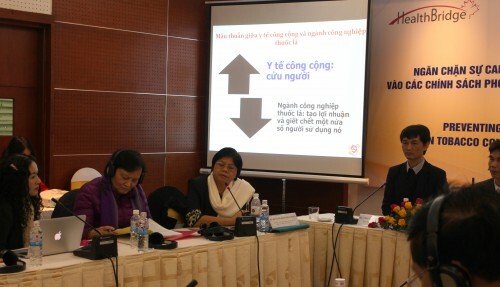 However, Mrs. Ritthiphakdee also judged that Vietnam has implemented WHO’s guidelines on Article 5.3. This is the reason why tobacco control policy has been adversely affected by tobacco industry. This inference are easy to happen because tobacco industry is sustainably being considered as an industry contributing to government budget, regardless of the tobacco consumption’s negatively impacts on economy. Moreover, tobacco control policy can refer to tobacco industry’s opinions and there are discussions between high position staffs of this industry and Ministry of Industry and Trade. Some recommendations are introduced in discussion section such as implementing strictly Tobacco control policies, imposing heavy sanctions for violators, raising taxes to halt the development of tobacco industry. Accelerating the implementation of Article 5.3 WHO FCTC and attaching it on National anti-corruption Programme was one of contents which was introduced and discussed extensively in the Workshop. Representatives and experts considered Article 5.3 as the most powerful tool against corruption and increase the transparency for government’s activities. In order to fulfill this, government should not allow tobacco industry’s representatives to participate in FCTC’s conferences; stop the interactions between high positon leaders of government and representatives of tobacco enterprises; establish behavior guidelines for authorities/individuals who have responsibilities to interact with tobacco industry; discuss about recent shortcomings in implementation of Article 5.3 with Governmental Departments to find the solutions. On the other hand, civil society’s responsibilities are also considerably essential. Civil society organizations need to strengthen and enhance their participants in supervising tobacco companies’ activities to prevent its development and adverse influences on public health policies.